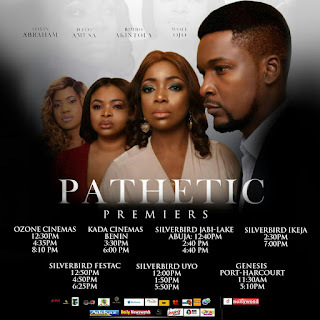 The Movie Pathetic which is currently showing in cinemas across the country after a highly successful launch will premiere in cinemas in Ibadan, Oyo state as the movie continues to garner praise and rave reviews weeks after its official release. The star studded movie featuring seasoned actresses like Dayo Amusa, Bimbo Akintola and Toyin Abraham is already one of the movies of the year with its very engaging storyline. Fans that have been waiting to get a glimpse of the movie will be able to do so on the 1st of April, 2017 by 5pm at the VIVA Cinema in the evening as the movie ‘Pathetic’ makes its way to yet another Nigerian city. Let's make a date with Dayo Amusa and other top Nollywood Actors!